The Road to the Horizon: Rumble: Trade liberalization, making the poor even poorer? Rumble: Trade liberalization, making the poor even poorer? Rice is the staple food of Haiti and up until the 1980s Haiti was self-sufficient in its production. 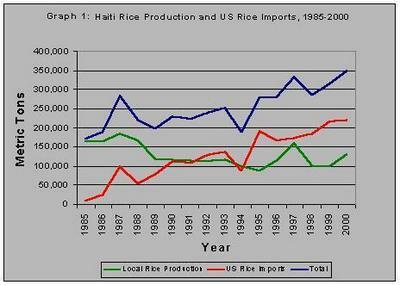 In the mid-1980s Haiti's domestic rice production decreased rapidly. By the 1990s rice imports outpaced domestic rice production. This displaced many Haitian farmers, traders, and millers whose employment opportunities are extremely limited. Import tariff reduction is a critical piece of the trade liberalization policies that are strongly advocated and many times mandated by international financial institutions like the International Monetary Fund (IMF) and the World Bank in the loan packages they negotiate with developing countries. In 1995 Haiti agreed to the pressure of the IMF to cut on rice import tax from 35% to the current level of 3%. Though it earned Haiti a score of 1 on the IMF's 1999 Index of Trade Restrictiveness, making Haiti the least trade restrictive country in the Caribbean, Haiti has also remained the least developed country in the Caribbean. It is the poorest country in the Western hemisphere. Three-fourths of Haitians live on less than $2 a day and 70 percent of the workforce is jobless or underemployed. More than half the country's children don't get enough to eat. The connection? Following the adoption of the import policies local production of rice in Haiti dropped dramatically. Rice import tariff reductions in Haiti has made it more difficult for local rice producers to compete with imports. Some argue that the resulting flood of relatively cheap rice imports originating mostly from the United States has had a negative impact on Haiti. The decline in the demand for Haitian rice has been devastating to an already desperate rural population. 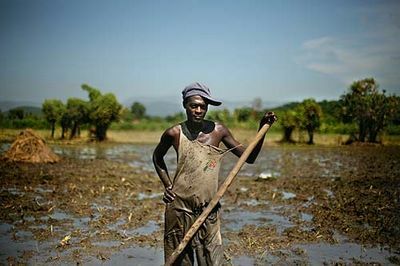 Rice farmers are some of the most vulnerable members of the population; the alternative employment options for farmers in Haiti are extremely limited.